2. @PlayChess.com. “Germany’s 1st board in some trouble vs Magnus Carlsen. 3. 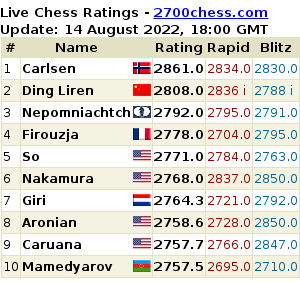 @ChessNotes: “R7: Carlsen has let slip the win vs. Naiditsch”. 4. @KingTurtleMusic: “Topsy-Turvy going on in Carlsen v. Naiditsch”. 6. @MarkTWIC: “In the minute or so it took to compose my last tweet it seems to me Carlsen has completely lost the thread and is in danger”. 8. @Jonathan_Rowson: “Gosh. Quite a turn around in Magnus’s game. As mentioned before, he’s a man, not a machine”.